Bring out a natural radiance with GlyMed Plus Cell Science Hand & Body Lotion. This nourishing, moisturizing treatment conditions the skin for a softer texture and youthful appearance. GlyMed Plus Cell Science Hand & Body Lotion is a lightweight treatment cream that drenches the skin with moisture using a botanial, non-greasy formula. Absorbing quickly into the skin for immediate results, shea and cocoa butters promote a softer complexion while enhancing the skin’s natural barriers to lock moisture in. The nourishing and reviving formula in GlyMed Plus Cell Science Hand & Body Lotion promotes a healthy complexion with youthful radiance. Use it on tired, dull areas and the hands for a truly brilliant complexion that looks and feels younger. Indulge in the nourishing power of GlyMed Plus Cell Science Hand & Body Lotion. 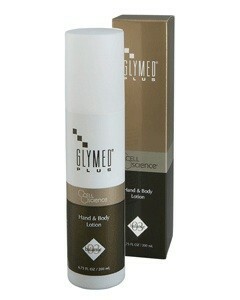 GlyMed Plus Cell Science Hand & Body Lotion is recommended for all skin types. Use on tired, devitalized skin all over the body for a moisturizing, rejuvenating treatment. Apply GlyMed Plus Cell Science Hand & Body Lotion to the desired areas after bathing. For a reviving treatment, apply it after spending time outdoors or after sun exposure. * Use anytime you want a relaxing, renewing, hydrating experience.